I can't say I've been as nervous and unsure about a topic as I am with this one. I have been doing some research on Johann Hofzinser, the great Viennese Magician. 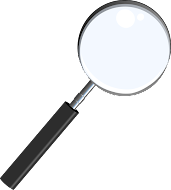 However, during the course of my research, I've discovered that much of what I read was probably wrong. The early history of Hofzinser was recorded by Ottokar Fischer, but according to magic scholar Magic Christian, Fischer was wrong about a lot of his information. Because Fischer was wrong, many of the later biographies of Hofzinser are also incorrect. Houdini gets a lot wrong in his Conjurers Monthly Magazine about Hofzinser. One fact that is clear, Johann Nepamuk Hofzinser was born June 19th, 1806 in Vienna Austria in the Landstraße district. He was a cousin to fellow Viennese Magician Ludwig Dobler. It's possible that Dobler is the one who first sparked Hofzinser's interest in magic. 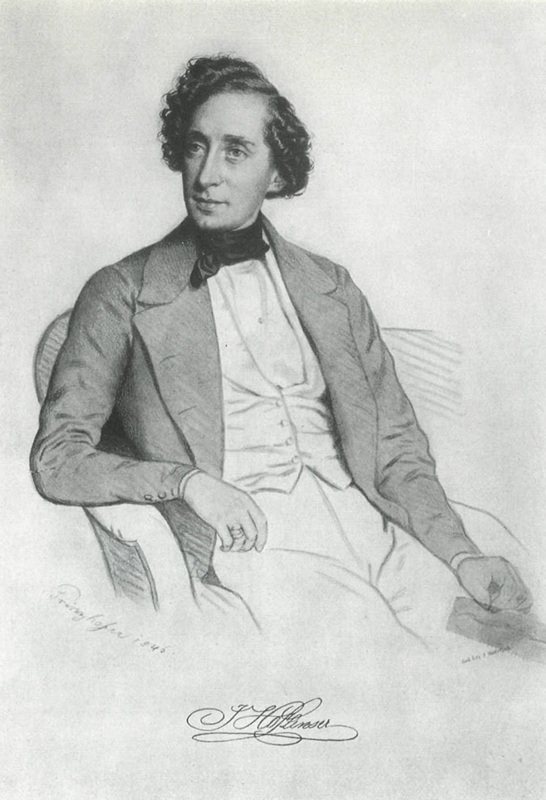 Johan held a job within the Viennese government in the financial ministry from which he would eventually retire from in 1865. Several years earlier he opened his first Magic Salon in 1857. He moved to 5 different locations from 1857 to 1865. Then after his retirement from the financial ministry it appears that Hofzinser took his show on the road. But it's his Salon work that is what is most important. Hofzinser was basically the father of Parlor Magic or Salon Magic. In his parlor presentations he presented both card magic, manipulation and apparatus magic. According the Dai Vernon, Johann Hofzinser was the Father of Card Magic. I'm intrigued with his card magic but sadly am not quite as familiar with it as I would like to be. 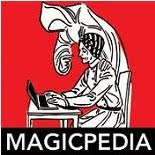 I know a bit more about his none card magic mainly because of the book 'The Magic of J.N. Hofzinser' by Ottokar Fischer. There are many intriguing pieces in his repertiore, but I am personally drawn to the routine known as The Apotheosis of the Rose. The effect begins with a hand held mirror which is shown on both sides. Then it's covered for a moment with a scarf and when the scarf is removed the image of a red rose is seen on one side of the mirror. As the performer speaks the rose grows paler and paler until it has completely lost it's color. The scarf is held in front of the mirror again and the image vanishes. 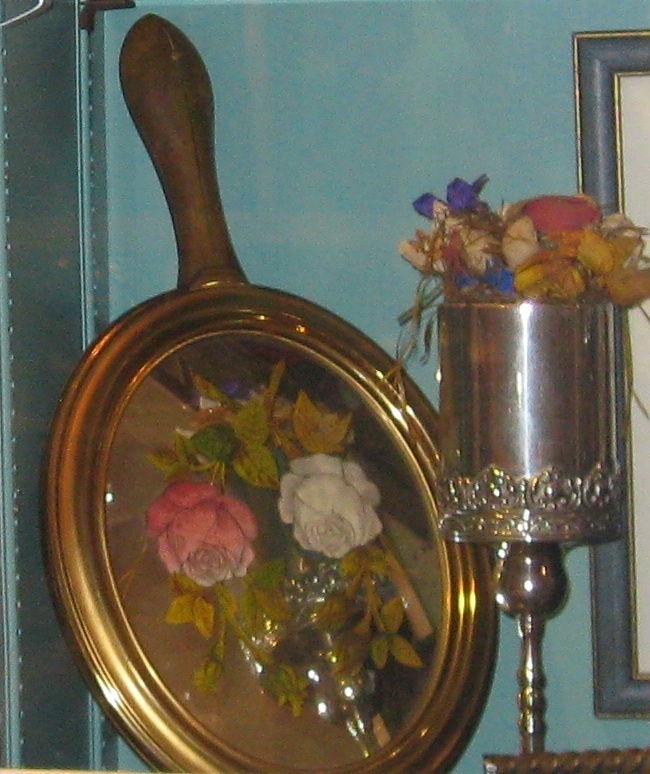 The scarf is held over a glass vase and the white rose appears inside it. When he removes the rose from the vase it again changes color leaving the red rose. And to that I say, WOW! I can't go into the workings, because I do not divulge magic secrets on this blog. But look at the photo to the left and you'll see the actual Rose Mirror used by Hofzinser, now in the collection of Ken Klosterman. The next routine that I find really interesting is called The Fountain of Love. It begins with a glass goblet containing some sort of murky dark water apparently from the 'Fountain of Love'. A borrowed ring is tossed into the water to test whether the volunteer who lent the ring has true love, for if he/she does, the water will turn crystal clear. The performer covers the glass goblet with a scarf for a moment and then when it is removed the water can be seen to be clear and there are a a couple goldfish swimming inside the goblet. But the even more amazing part, one of the fish apparently has the ring in it's mouth! A net is used to retrieve the fish and the ring. That is a fantastic effect, but according to the book, Hofzinser was not happy with it and changed the props and even altered the method. The later routine became known as The Ink of the Enamoured and it was basically the same general idea but Hofzinser added some additional beats to the routine to prove there was really ink in the vessel. He put a white feather into the liquid which came out black and used a ladle to remove some of the ink and pour it into a glass. In the collection of Ken Klosterman is the original Fountain of Love goblet along with the Ink Ladle which can be seen in the image to the right. Another interesting effect in Hofzinser's show was called The Card Automaton. It was a small box in which a pack of cards was inserted. Any card could be called for and it would rise out of the box. According to the book 'The Magic of J.N. Hofzinser', the prop is actually in the possession of the Library of Congress in Washington D.C. I do know that Ken Klosterman also has a Card Automaton in his collection but it looks a little different than the one pictured in the Ottokar Fischer book. Still, Klosterman might very well own the original, I don't know. I was not aware that the Library of Congress possessed any Hofzinser items, but apparently they do. The list of Hofzinser's original sleights, card effects and apparatus tricks is staggering. He was an incredibly inventive artist who not only invented many methods still used today, but improved on countless props that existed in his time. On top of that he wrote poetry that was used in his presentations and also composed music for his act as well. In the video below, you can hear one of the pieces that Johann Hofzinser wrote for his show and see a number of wonderful images of the great Viennese Conjurer. Enjoy! According to Magic Christian's wonderful website on Hofzinser (Hofzinser.net) the final performance that Johann Hofzinser gave was New Years Eve 1875. He would become ill shortly after this and was sick for six weeks until he finally passed away on March 14, 1875. He is buried in Vienna Central Cemetery in Vienna Austria. By the way, there is a wonderful tribute to Hofzinser in the Ricky Jay and His 52 Assistants Show. Ricky does a version of Everywhere and Nowhere with a nice twist at the end. The routine is at about 36 minutes in....click the link to see the entire show on youtube. Nice piece, Dean! Can you double-check that link to Magic Christian's tribute website - it does not seem to work. Also - any word on the English translation of the Hofzinser trilogy that Magic C. has been working on for lo these many years? David, try the link now, it should be working. I had exchanged emails with Magic Christian a couple years ago and if my memory is correct, he was working with Stephen Minch to have the books translated. But I don't know the status today. Magic Christian has written three books on the Parlor Magic of Hofzinser. They will surely be a must have once they are in English!